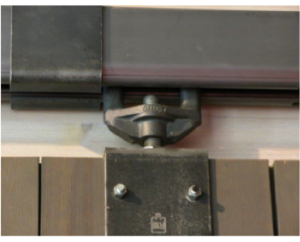 Open track and flat track were the earliest styles of sliding door systems first used for barn and stable door operation, and later for garage door application. These rudimentary track systems were dirty, dangerous, and prone to having the trolleys unseat from the track, taking the heavy doors with them. Enclosed box track was invented in the 1930s. The new style hardware track brought many advantages to the sliding carriage door, the foremost of which was greater safety. Enclosed track hardware reduced the incidents of trolleys and the attached doors jumping the track. This improvement also provided cleaner operation by shielding the track and trolleys from dust and dirt. The rigidity of the enclosed box track increased door weight capacity as well. 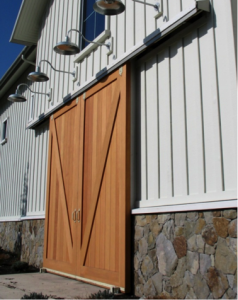 Today, there are several types of open and enclosed barn door track systems available, but the basic functionality is the same. The track hardware is mounted over an opening. 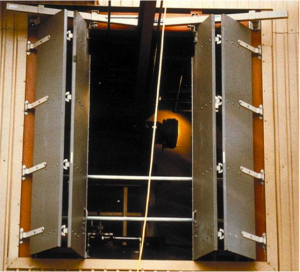 Door sections are outfitted with hanger assemblies that ride in the enclosed track, or on the open track, allowing doors to smoothly open and close. 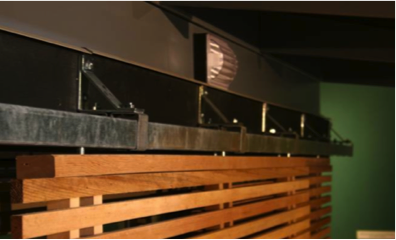 Preference for the style of barn door track system is usually based on price, aesthetics, or environmental considerations. 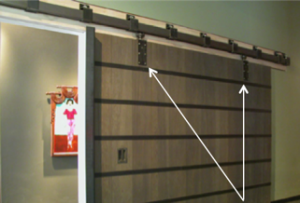 Whether you are looking for interior or exterior sliding barn door hardware, or heavy duty barn door hardware, there are special factors to keep in mind when specifying sliding door systems. Foremost elements are the type of track, weight capacity and length required, in addition to the hardware hangers, style of mounting brackets and the centering distance for mounting the brackets. In order to choose the correct sliding barn door hardware for any particular door, a few important points must be taken into consideration. 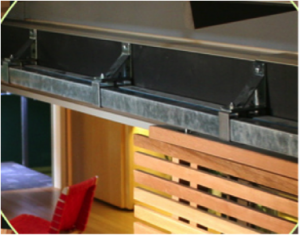 Richards-Wilcox 888 Series heavy duty track supports doors weighing up to 5,000 pounds. Notice the welded support rods for added rigidity and strength. 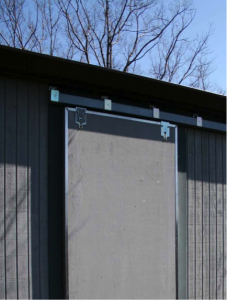 Enclosed track hardware comes in many weight capacities to handle a variety of doors from lightweight fiberglass doors to even the heaviest of steel doors. Flat track systems and hardware are offered in capacities from 400 – 800 lbs., but typically not in higher capacities. Track hardware can be enclosed in a wood or metal structure called a canopy to conceal or further protect the track from the elements. 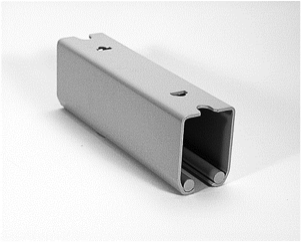 Sections of the track door hardware can be welded together or joined with joint brackets to make the required length. How Much Track Do I Specify When Selecting Track Hardware? When sizing track for the opening, there should be enough track to hold the door in the open position without obstructing the opening. Example: A 10’ wide opening with a 10’ door requires 20’ of track, so that when the door is opened to one side, it fully clears the opening. What About for Bi-Parting Doors? In the case of bi-parting doors, the same 10’ opening with two 5’ wide doors requires 20’ of track. However, the track sections are joined in the center with a Center Stop Bracket, preventing either door leaf from traveling beyond the halfway point. Why would I choose one style of door over the other? The choice usually comes down to lack of room to slide a door in one direction or another. A 10’ wide opening would require a 10’+ wide door. If there is insufficient room on either side to store a single large door, the solution is a bi-parting door (see photo example above). Track capacity is based on the weight of the doors, regardless of whether the application is for a single door or bi-parting doors. When determining the capacity for bi-parting doors, consider the weight of one door leaf, not the aggregated weight of both doors. One 600-lb. 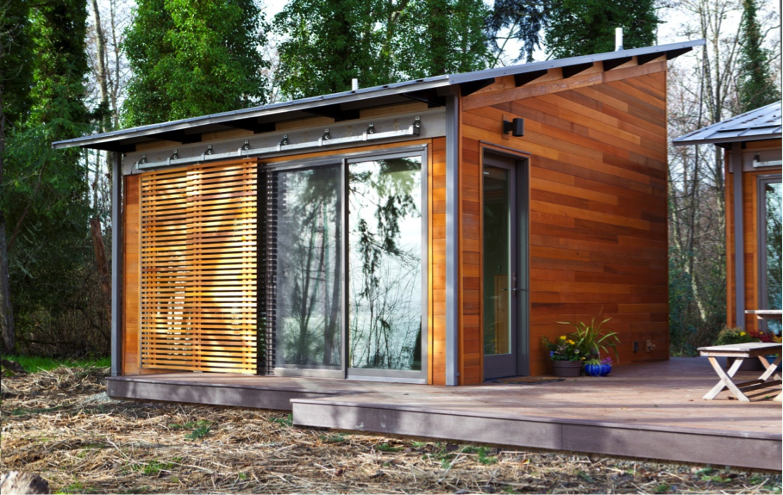 single sliding door would use a 600-lb. track system with support brackets spaced 24” on center and a pair of hangers for the door (two hangers). 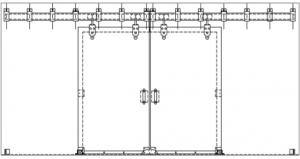 A single track door system with two 600-lb. door leaves, one door sliding left, one door sliding right (bi-parting) would also use a 600-lb. track, not a 1200-lb. track system. Each door leaf weighs 600 lbs., and each door leaf would have a pair of hangers (four hangers in total for the system) and support brackets spaced 24” on center. Hangers are an integral part of any barn door hardware kit. Hangers are usually sold in pairs (two per door) to ensure proper ordering and installation. 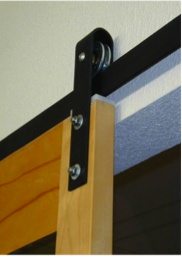 Proper mounting of hanger trucks is critical to protect the sliding door system and extend its life. It is very important that each door leaf have only two hangers (attachment points) regardless of the size of the door. 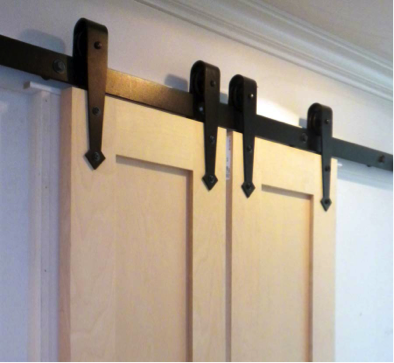 Attaching more than two hanger trucks on a single door can create a fulcrum or “teeter-totter” effect and cause the track and hangers to wear unevenly, damage the door, or even make it difficult to operate the door properly. 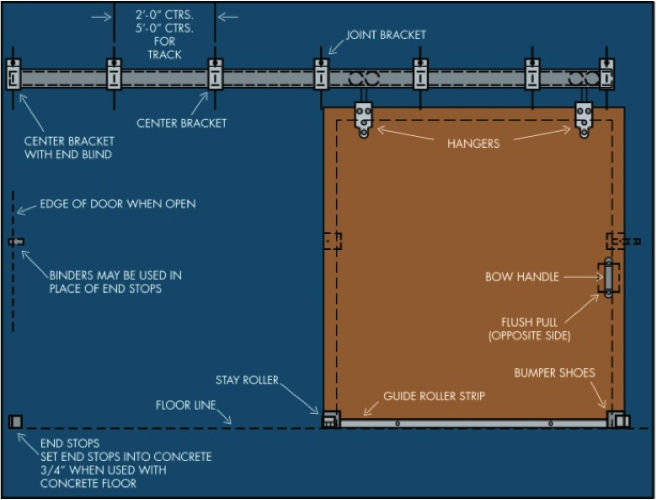 Hanger requirements based on door size are indicated in the table below. Track is usually mounted to the face of a building or wall with Sidewall Brackets spaced on a maximum of 24” centers. Lock-Joint hardware Brackets can be used to bring together two edges of track to make a continuous run. Center Stop hardware Brackets are installed in the middle of a track run for bi-parting doors to prevent each door leaf from traveling beyond the center point. The Double Style Sidewall Bracket is used for mounting track for parallel sliding doors for double track systems, for example, a 10’ wide opening where a 10’ wide door will not physically fit on one side or the other, and the stacking of two smaller door leaves is required. Alternatively, a parallel door system could be used for privacy screens in front of access doors as shown here. 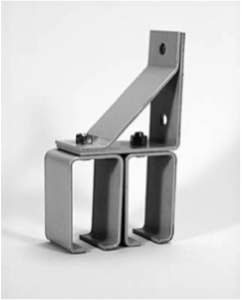 When sidewall mounting is undesirable or impractical, overhead brackets are available for mounting track to an overhead structure. Center Overhead Brackets and Cross Ear Brackets are made for this function, as well as Overhead Lock-Joint Brackets for piecing together two sections of track. The unique application below is a rotating art gallery in a reclaimed manufacturing facility. A complex series of overhead mounted tracks hold panels for displaying art. Cane bolts secure the panels in place in the floor. 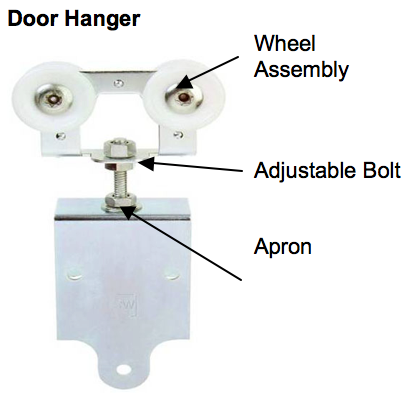 Door hangers, sometimes called trolleys or trucks, have a wheel assembly with an adjustable bolt and apron. The apron is the bracket that drapes over the door allowing for attachment of the hanger to the door. Typical applications for door hangers with aprons are wood or fiberglass doors. 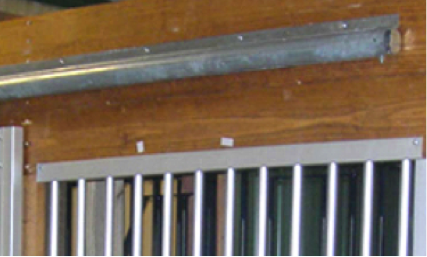 The door hanger capacity must match the track capacity to create a compatible system. For lower weight capacity systems, light duty hangers feature synthetic wheels. These wheels have quiet operation, cause less wear on the track, and reduce spreading of track more than steel wheels. Hangers with all metal wheel construction (ball bearings or roller bearings) are specified for heavier sliding door applications. The aprons are replaced with an optional top plate assembly which screws to the top of the door. Top plates are used primarily for wood doors for aesthetic purposes, as they provide a clean-looking door face. 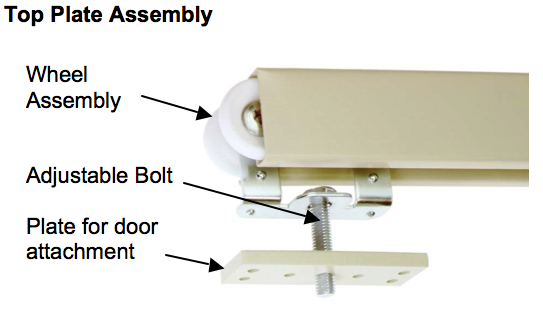 Alternatively, the pendant bolt can attach directly to the top of a metal door without the use of a top plate. Hanger wheel assemblies come with steel wheels in either roller bearing or ball bearing designs. The choice of which flat track door hardware type to specify is contingent on the application. Less costly roller bearing assemblies are suited for systems that have a lighter frequency of use. The more expensive ball bearing assemblies are used for heavier capacity systems with intense use. 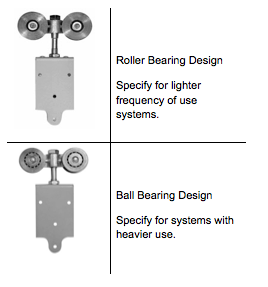 Ball bearing hangers cause less friction and extend the system life, so there is a payoff for the increased cost. In large capacity systems, there is significant differentiation in trolleys. Selecting a trolley depends on system capacity requirements. 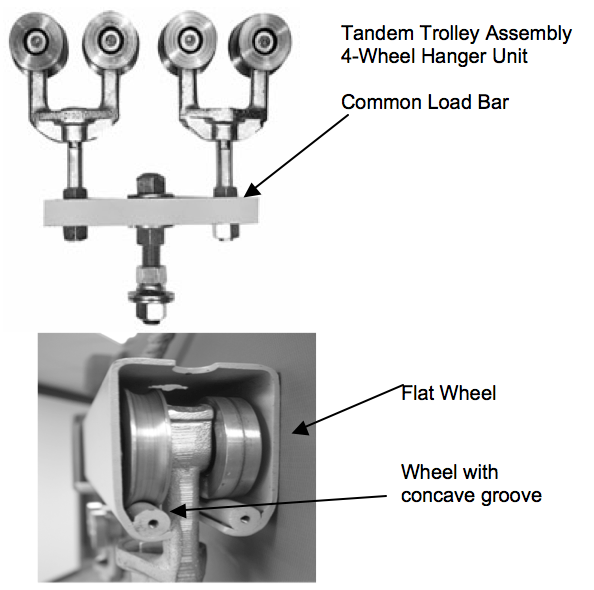 Hanger selection is critical for larger weight doors and can require a tandem trolley assembly with a common load bar to distribute the weight for doors that are 2,500 – 5,000 lbs. For extremely heavy doors, a four-wheel hanger unit is used: two wheels are machined flat; two opposite wheels are machined with a concave groove that matches the radius of the rods in the runway to achieve a low friction factor. The load bar hangs from one central point, but there are only two hanger assemblies per door. Note that the increased size / length of the wheel assembly may require more head room between the door and track. A unique hardware application that combines a sliding door system with hinged doors that fold is a Slide-Fold Doors. This system is used on large manually-operated or powered doors which require the door panels to slide and fold to each jamb to leave a clear opening. Slide-Fold Systems have multiple door sections, ranging from two to six sections. 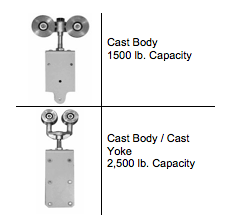 Several sizes of hardware and track are designed to handle total door system weights from 2,000 to 5,000 lbs. with a maximum opening size of 18’-0”. Disc bearing hinges are typically used for manually-operated slide-fold doors and ball bearing hinges for power-operated slide-fold doors. The number of hinges per door is calculated by the door height, with three hinges required for doors up to 8’ high, and four to six hinges for doors that are 8’-1” to 20’ high. In addition to the center hinges and back plates required for these doors, jamb hinges allow the doors to swing clear of the opening. Special consideration must be given to the thickness of the doors, door and jamb construction, and headroom conditions. 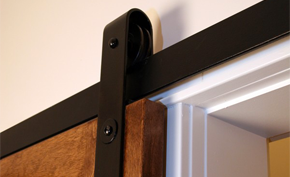 Traditional Flat Door Systems for light to medium duty doors are regaining popularity for their aesthetic appeal, increasing the demand for high-quality barn door sliding hardware. 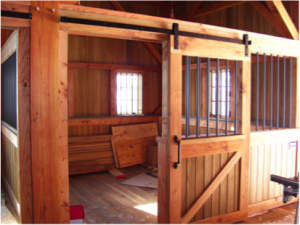 Commercial applications include doors and partitions in retail environments and theaters, room dividers, carriage houses, and garage doors in residences and high value stables. Medium Duty: Doors up to 400 lbs. Heavy Duty: Doors up to 800 lbs.